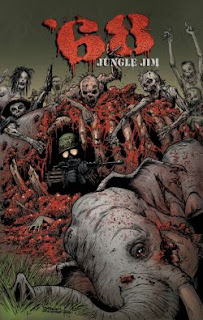 The Fellowship was fortunate enough to obtain a copy of ’68 JUNGLE JIM #1 from Image Comics. Mark Kidwell writes, and Jeff Zornow draws. Curliss is one hell of a soldier. He fights like a madman, and he’s extremely loyal. He’s got a job to finish, and he’s not going to let Sarge down. The problem is what happens to the NVAs he kills. There’s also a nice French girl working in a mission out there, and she’s about to run into some trouble. This is certainly an interesting variation on a Vietnam War story. But for me the zombie thing is secondary. I really like Curliss, and I’m looking forward to “meeting” Sarge. I’m also curious about the role Manon will play in this. This is a really nice beginning to what could be a great story, and I really want to see how it unfolds. ’68 JUNGLE JIM #1 is available now at your FLCS or by order at imagecomics.com.